Did you know that the bible talks about me her? Oh let’s face it. We have all been the irritating woman at some point. Right? Please tell me I’m not alone. In fact, I was the irritating woman yesterday morning. Don’t worry. I’ve repented and I’ll show you how I apologized. 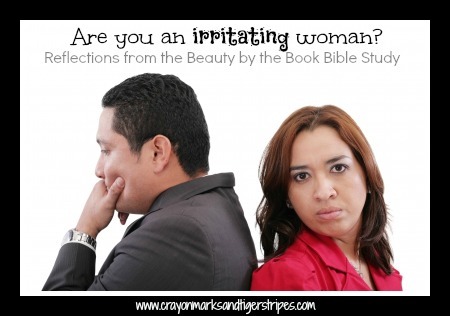 Let’s look at a few different verses that show us what an “irritating woman” looks like. Proverbs 19:13- A nagging wife annoys like a constant dripping. Proverbs 21:19- It is better to live alone in the desert than with a crabby, complaining wife. Proverbs 25:24- It is better to live alone in the corner of an attic than with a quarrelsome wife in a lovely home. Proverbs 27: 15-16- A quarrelsome wife is as annoying as a constant dripping on a rainy day. Stopping her complaints is like trying to stop the wind or trying to hold something with greased hands. She sounds like a difficult person, doesn’t she? She causes discourse and strife. She pouts and pleads. She is demanding and nags. She wants her way. She is, as Laurie calls it, the 3C’s- contentious, crabby and complaining. She is sassy! She doesn’t sound like anyone I want to know. Oh wait. I do know her…because I am her sometimes. I can’t say I never complain, never nag, am never crabby, never quarrel…because I do all those things. I can be sassy and I am quite good at it. Not a proud moment for me here. This is a dvd bible study we are doing at church so when Laurie (on the video) stated “We all have been the irritating woman,” I hollered out a big AMEN. It just kinda came out. Ya, that was embarrassing. In Gen. 3:16, it says “Your desire will be for your husband and he will rule over you.” The word desire in this context means to “want CONTROL over.” When we don’t get our way or don’t feel in control, we become the irritating woman and the Lord doesn’t approve of this kind of sassy behavior. But if we operate in the SPIRIT, we can let go of that desire to control. That is one of my favorite quotes from Laurie Cole (author of the Beauty by the Book bible study). There is a cure for those 3C’s. It can be replaced by the 3B’s- Build, bless and Benefit! Ephesians 4:29- Let no unwholesome word proceed from your mouth, but only such a word as is good for edification, according to the need of the moment, that it may give grace to those who hear. 3B speech is kind, compassionate, and forgiving. It holds its tongue; it is timely; it is thinking before you speak; it is not quarrelsome; it uses words with restraint; it is even tempered. It is loving, and blesses others. So about that apology? I have had this card sitting in my desk for a long time, waiting for that whammy of a fight where I would need to pull it out and apologize. I realize now there was probably more than one occasion that I was the irritating woman and could have used this card. I used this card to apologize to my husband, not for just yesterday morning, but for being the irritating woman. I am very happily married and I am crazy in love with this guy. I want to be the kind of wife God calls me to be for him. Don’t let the irritating woman possess you like she did to me yesterday morning! Ask God to guide you to use 3B speech in all your relationships. Ask Him to help you from falling into default irritating woman mode. When you feel yourself slipping into default mode, go to Him in prayer and ask Him to help you from becoming her! Do you ever find yourself slipping into default irritating woman mode? What do you or will you do to keep yourself from becoming the irritating woman? To study this topic further (which you really should! This bible study is amazing! ), check out Laurie Cole’s bible study Beauty by the Book. I'm so blessed reading this. Love it, I might need to have an apology card on hand! This is great! I have to constantly remind myself to help-meet instead of help-beat (Not actual beating of course). Thank God for the grace he gives us and for sweet husbands who do too! Aw, what a sweetie you have! You ARE a lucky girl! I hope your little man is feeling better-had my son at the dr. today with another ear infection as well, but nowhere near as traumatic as yours. I am so lucky that he puts up with me! I hope your son is feeling better soon!